The Artisan Range from Vrede en Lust consists of experimental wines made available to the cellar’s wine club, select restaurants and via the tasting room. 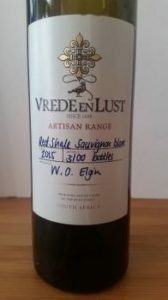 In addition to its main Paarl holdings, Vrede en Lust more recently established vineyards in Elgin and The Red Shale Sauvignon Blanc 2015 is further evidence that this was an astute move. It’s a striking wine with pear, lime and fresh herbs on the nose and palate. Really tight and focused with great purity of fruit and driving acidity before a pithy finish. Price: R99 a bottle.